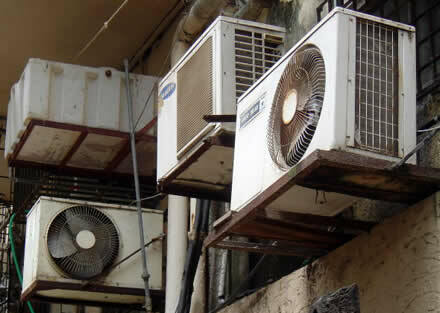 Easily the most common way to cool a home or office space is with air conditioning. This section of the site deals with air conditioners of all types from large central building installations to window or wall mounted units along with portable and free standing models. The means of keeping an enclosed habitable space at a comfortable temperature is something that we humans have made a priority down through the ages. From the earliest cave dwellers that discovered fire and harnessed its power to warm their habitats as well as ward off wild predatory animals, we have embraced one solution or another to maintain the temperature inside our habitats at a point where we do not feel unduly cold or hot. Before the earliest refrigeration devices were invented, people still needed to have a means of reducing the ambient temperature inside their homes when the weather outside became unbearably hot. Let's take a look at how things progressed. Manually fanning themselves with hand held fans, people in Mediterranean countries coped with searing hot summers with the discovery that moving air helped cool the skin when they perspired. This would eventually lead to the invention of mechanical fans, but that came much later. Before the convenience of AC became widespread in homes and workplaces, people found many natural ways of dealing with excessive heat. The most effective way to reduce heat in a building in hot climates was to create lots of shade and insulate the walls and attic. Since insulation as we know it today didn't exist, the best way of keeping the interior of a building from heating up was to build the walls very thick. This was to prevent heat from outside conducting through the building medium to the interior walls. 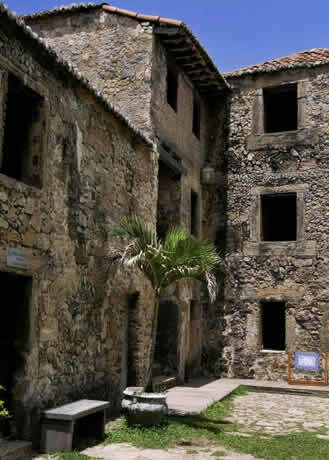 If you look at old Mexican or Spanish buildings, you'll see the external walls were often two feet or more in thickness! Shading was the next best way to stay cool with the idea being that if you can keep the sun off the walls and roof, it won't heat up as much during the day. This is why porches or verandas were built onto buildings to provide shady areas to sit outside and also to keep the sun off the walls. Building a farm house beneath a large deciduous tree meant the building would benefit from the tree's shade during summer to keep it cool. The flip side is that this idea also allowed the weaker winter sun to provide some heat during the colder days. Orienting the building so the long axis faced south with the biggest windows on the south wall coupled with an overhanging roof meant you collected sunlight during winter when the sun's orientation in the sky was at a low angle. Then in summer, the overhang kept the sun off the front of the building when it was high in the sky during the hottest part of the day and when its rays were strongest. Since the advent of air conditioning to cool the interior of buildings, designers and architects seem to have forgotten the old methods of building orientation and natural cooling. They create massive glass-fronted structures that are akin to huge greenhouses that are a cooling specialist's nightmare then hand the building over and say "Now cool that if you can!" Of course the resulting energy needs to achieve that were many times higher than they could have been with better solar orientation design incorporated. But for smaller building such as homes, small offices and workshops, installing air conditioning is still the most effective way of keeping the interior temperature comfortable. It may not be the cheapest in terms of energy consumption, but it is certainly the most effective. So let's look at the many different kinds of AC as well as alternative cooling solutions that can be surprisingly economical depending on the circumstances.